A former Sesame Street writer stepped into a longtime debate, saying he considered Bert and Ernie to be a gay couple. New life was breathed into a perennial debate this week, when a former Sesame Street writer revealed that not only did he consider beloved characters Bert and Ernie to be a gay couple, but he used his own relationship as creative inspiration. On Sunday, Queerty published an interview with Mark Saltzman, who worked on the show in the 1980s and 90s, asking him if he thought of Bert and Ernie as a gay couple. "I always felt that without a huge agenda, when I was writing Bert & Ernie, they were," Saltzman said. "So I don't think I'd know how else to write them, but as a loving couple." Saltzman was in a longterm relationship with another man when he joined the show. "That's what I had in my life, a Bert & Ernie relationship. How could it not permeate?" Saltzman told Queerty that even though the inspiration behind his writing was clear, he wasn't exactly open about it at work. "I would never have said to the head writer, 'Oh, I'm writing this, this is my partner and me,'" Saltzman said. Even though Saltzman is speaking out now, his word is far from the final one on the matter. The organization behind Sesame Street quickly stepped in, reiterating its longtime stance: Bert and Ernie are just friends. "As we have always said, Bert and Ernie are best friends," Sesame Workshop said. "They were created to teach preschoolers that people can be good friends with those who are very different from themselves. Even though they are identified as male characters and possess many human traits and characteristics (as most Sesame Street Muppets™ do), they remain puppets, and do not have a sexual orientation." The back-and-forth is just the latest in a years-long dispute. The statement Sesame Workshop issued Tuesday is the same one verbatim that it released seven years ago. Sesame Workshop was responding at the time to an online petition making the rounds calling on the duo to get married. Bert and Ernie's relationship status also notably cropped up in 2013 when The New Yorker featured the pair snuggled on the couch presumably watching the Supreme Court ruling in favor of gay marriage. It was called: Bert and Ernie's "Moment of Joy." 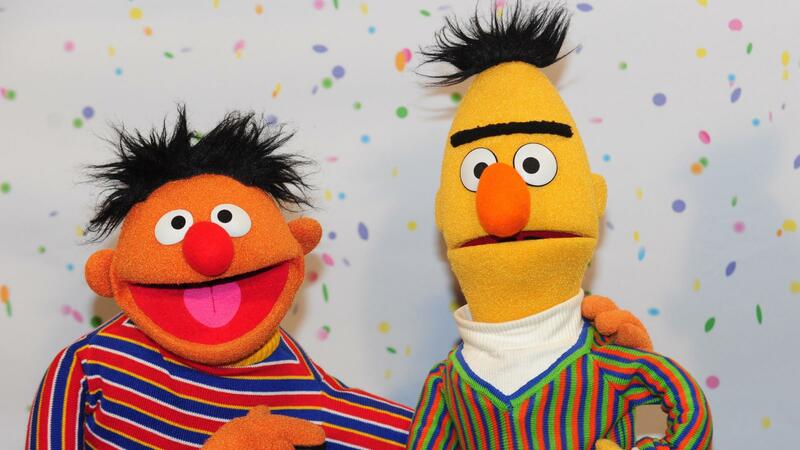 It even made its way overseas, when a judge ruled in 2015 that a bakery run by conservative Christians in Northern Ireland discriminated against a customer by refusing to make him a Bert and Ernie cake reading "Support gay marriage." While the debate over, 'Are they or aren't they?' may never end, some people are questioning why it even matters. Frank Oz, who is credited with creating Bert in 1969, as well as originally performing as the character, tweeted Tuesday, "It seems Mr. Mark Saltzman was asked if Bert & Ernie are gay. It's fine that he feels they are. They're not, of course." Oz went on, "But why that question? Does it really matter? Why the need to define people as only gay? There's much more to a human being than just straightness or gayness." When pressed by other Twitter users about how he could contradict Saltzman's point of view, Oz doubled down, "I created Bert. I know what and who he is." "We really have to stop talking about this," tweeted writer R. Eric Thomas. "They are Muppets; I cannot possibly summon the energy to have a position beyond 'whatever.' Ernie did not throw the first brick at Stonewall." But as others have pointed out, Sesame Workshop's denial of Bert and Ernie's relationship on the basis that puppets cannot have a sexual orientation would seem to fly in the face of heterosexual romantic feelings expressed by other beloved Muppets, like Kermit and Miss Piggy. Louis Peitzman of Buzzfeed News tweeted, "I don't really care if Bert and Ernie are gay (they are), but I'm definitely over straight people telling me queer identity doesn't matter."